Regional metamorphic rock. 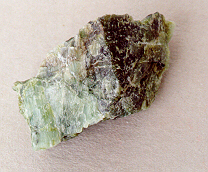 Serpentine is a very common secondary mineral, resulting from a hot water alteration of magnesium silicates (mostly peridotite), present in magma. Serpentine is found in the US, Canada, China, England, Russia, Italy and India. Colors can vary from different shades of green to black, red, white, yellow and brown. The serpentine group contains several polytypes. Antigroite, which occurs in tough, compact, often pleated masses in shades of dark green (often schistose in formation as well). Chrysotile, which is almost always in fibrous yellowish-white or green aggregates. And Lizardite, which is in minute scales or compact whitish aggregates. Serpentine is actually the name for this mineral group and Serpentinite is actually the name for the rock group regardless of the type of dominant serpentine mineral. In other words the serpentine minerals are the major constitutes of the rock serpentinite. The name serpentine may come from the Latin word serpens, for "serpent." Some feel that the name "serpentine" is derived from the ancient belief that it cured a serpent's bite or because it resembled the dark green mottled variety of a serpent's skin. The California coastal ranges are essentially made up of large massive serpentine formations. This is why I chose this mineral as the first in the series, as I live in San Francisco and am surrounded by and profoundly affected by it. The Bay Area produced a relatively soft, light green or yellowish-green variety of serpentinite (principally antigroite), with a micaceous cleavage, a pearly luster and a greasy feel. This is the variety we will be concerned with here. These formations are usually massive and cryptocrystalline in appearance and are found in other parts of North America and Italy as well. Serpentinite stimulates the heart, kidneys, lungs and pituitary and thymus glands. On a cellular level, there is increased oxygenation of the red corpuscles. Oxygen is more easily absorbed throughout the entire body. The astral and emotional bodies are aligned, which alleviates general fear and paranoia, develops an altruistic nature, and increases the capacity for psychic abilities. Serpentine can be used to improve meditation and to enhance the visionary capacity. Chlorophyll absorption improves, feminine qualities become more balanced, and the heart and throat chakras are mildly stimulated. It creates a mood of tranquillity in which one emanates an aura of calm, peacefulness and harmony. It enables one to be resigned to, and more easily accepting of, difficult or unpleasant aspects of ones life that cannot be avoided, and must be handled. Makes one feel more grounded and capable of dealing with any situation. Good for counteracting depression. Helps to balance those with a stoic attitude.